Portrait of a science writer in their natural element. Since the summer of 2011, I have been earning part or all of my income from writing alone. 2016 was a complicated year, to put it mildly. On the one hand, we had unqualified scientific successes: the discovery of gravitational waves by LIGO (which I wrote about for The Atlantic), the launch of OSIRIS-REx (which I wrote about for New Scientist), the triumphant end of the Rosetta mission (which I um…didn’t write about), and many more. On the other, we had a series of political crises: the withdrawal of the UK from the European Union, throwing many people’s lives and livelihoods into chaos (including many scientists), and of course the US Presidential election, which resulted in the election of a man who ran on explicitly racist and misogynistic language. Naturally, said President denies climate change is real and plays footsie with anti-vaccination activists. Then there’s the long list of musicians, actors, and other celebrities who died in 2016. But because I’m a slow learner, I have a new book concept in mind. I’m taking a little time off from other writing to finish the proposal to publishers. If and when I make progress on that, I’ll reveal more, but for the time being stay tuned. Hopefully things will go better this time around! I also have been spending 30 minutes daily on writing fiction for the last two years or so. I self-published the first fruits of that experiment: a science-fiction novella titled “East of (h)Eden”, available on Amazon Kindle and other ebook readers. If you’re interested in reading a bit before buying, I put two short excerpts on Tumblr: excerpt 1 and excerpt 2. The next project is far more ambitious: a full-length fantasy novel. (Yes, a standalone novel, not volume one of a series or trilogy. This alone might disqualify it from being published.) I’m currently about one-third done with it, but it’s obvious that 30 minutes daily isn’t enough time. So, during the same time I’m working on my new book proposal, I’ll be hard at work finishing the novel, or close enough that going back to 30 minutes daily can wrap it up. I don’t have a title yet, but suffice to say the novel involves bloodthirsty ghosts, parasitic wasp-demons, a badass elderly lesbian, and a lengthy excursion to a land of literal nightmares. No kings, swords, elves, dragons, or “destiny”, but the story has plenty of magic. Being me, it also has some science hidden in it: the novel takes place on a planet orbiting a binary star, so all their mythology and timekeeping are based on the cycles of their twin suns. I’ll blog more about that later. There’s also a bit of evolution, and several of the monstrous beings are based on real extinct animals on Earth. Hopefully you’ll enjoy reading it as much as I’m enjoying creating it. I should mention one change: I have stepped down as Director of CosmoAcademy. The program is a great one, but it involves too much work that’s difficult for me to do as an independent contractor. Too many resources the job requires need someone who works for a university or other institution, and that’s not me right now. So, I regretfully resigned at the end of 2016. I’ve been involved with CosmoAcademy for a number of years now, so it’s a big change to pass it on to someone else, but I hope the program will grow and become more successful in the future. 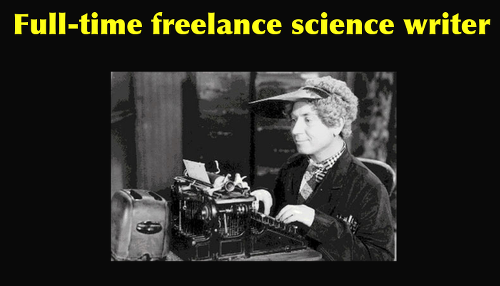 Of course, I’m a freelance science writer by profession, so expect more from me on that front. I’m working on lining up some new paid work, and have a few ideas for articles and essays. Having been bitten by the comics-writing bug, I hope to script at least one or two new comics in 2017 as well. To quote my favorite novelist of modern times, Terry Pratchett (from Men At Arms): “Sometimes it’s better to light a flamethrower than curse the darkness.” These are indeed dark times, and my writing is my flamethrower. Keep watch for the fire in 2017.